the treatment of raw water in small or rural communities. The purpose of water purification is to change the aquatic environment so that it does not support detrimental microbiological life forms. The most important and final process used in the destruction of micro-organisms is disinfection. Chlorine is traditionally used for disinfection. With the use of chlorine a possibility exists that by-products may form, which are potentially toxic and carcinogenic. Another concern is that a number of pathogens particularly spore-bearing bacteria and micro-organisms with encapsulating structures such as Cryptosporidium spp. and Giardia spp., are far more resistant towards chlorine disinfection than indicator organisms traditionally used. These concerns and the fact that germicidal Ultraviolet radiation does not produce undesirable by-products and is effective in the inactivation of a variety of micro-organisms have contributed to the interest in Ultraviolet light as a disinfectant. Water treatment in rural or small communities is another reason for the use of physical methods rather than chemical disinfection methods. As it is known that skill levels in these communities are often undeveloped and technical qualifications is rarely found. Therefore the methods used must be easy to operate, maintain, and relatively inexpensive. Ultraviolet-light disinfection can thus be effectively applied as very little power is consumed and little operating and maintenance input is requires. Other alternative disinfection method is physical unit and advanced oxidation processes. These processes involve the generation of highly reactive free radical intermediates. These advanced oxidation processes are potentially beneficial as pre-treatment steps that compliment other treatment processes. This article addresses the effect of Ultraviolet, cavitational flow and ultrasonic sound alone or in combination have on protozoan cysts and oocysts, spore-baring organisms and bacteriophages. These organisms are commonly found in raw water sources available to rural communities. This article also addresses the most effective treatment option in terms of bacterial inactivation efficiency, ease of operation and maintenance. It concludes that hydrodynamic cavitation alone or in combination with Ultraviolet and ultrasonic cavitation is not successful in inactivating bacteria, bacteriophages and protozoa. An explanation is that the retention time used is not sufficient for the inactivation of the micro-organisms. Of the treatment options tested Ultrasound and Ultraviolet alone or in combination is the most effective methods. A retention time of 2.26s and Ultraviolet dose of 23.93 mW.s/cm2 was best for the inactivation of bacteria. The optimum retention time for ultrasound was 5.52s with a 99.9% inactivation of SPC. For Ultraviolet and Ultrasound in combination an optimum retention time for best removal was found to be 2.26s. Of the micro-organisms used in the evaluation Clostridium is the most resistant to treatment options evaluated. Best method for the inactivation of Cryptosporidium as determined by mouse infectivity was Ultraviolet and Ultrasound in combination. The drinking water quality must be of such standard that it does not give rise to health hazards. Contaminants could be either chemical or microbiological. Disinfection of water and wastewater with Ultraviolet radiation appears to be a potential alternative to the use of chemicals such as chlorine. The fact that germicidal Ultraviolet radiation does not produce undesirable by-products and is effective in the inactivation of a variety of micro-organisms (Chang, et al, 1985) have contributed to the interest in Ultraviolet light as a disinfectant for water and waste water (Cairns, et al, 1995). A number of pathogens particularly spore-forming bacteria and micro-organisms with encapsulating structures such as Cryptosporidium and Giardia spp., are far more resistant towards chlorine disinfection than the traditional indicator organisms (Ransome, et al, 1995). Filtration has been considered the only effective means of removing of Cryptosporidium spp from drinking water supplies. Ozone and Ultraviolet are now considered excellent alternatives for inactivating oocyst in water. Very few water treatment plants in South Africa are equipped with ozonators, which are expensive to install and operate, and therefore the majority water treatment plants rely almost entirely on chlorination and chloramination for disinfection of drinking water. Chlorine resistant enteroviruses are effectively inactivated by Ultraviolet doses of 25 mW.s/cm2. Ransome at al (1993) found that Ultraviolet doses of 80 mW.s/cm2 was needed to reduce excystation of Cryptosporidium parvum by 90% and 120 mW.s/cm2 was required for a 99% reduction in excystation. Bukhari et al. (1999) found that dosages as low as 41 mW.s/cm2 are needed for >4log inactivation of Cryptosporidium parvum and dosage as low as 19 mW.s/cm2 for a 3.9-log inactivation of Cryptosporidium oocysts. Mofidi et al. (2001) found that dosages as low as 11 mW.s/cm2 are needed for two-log (99%) inactivation of infectious Cryptosporidium parvum. Clancy et al. (2000) showed that low dosages of 3 mW.s/cm2 of medium pressure Ultraviolet light inactivate Cryptosporidium oocysts by 3.4-log. It was also shown that there is not a significant difference between the efficiency of low and medium pressure Ultraviolet lamps when inactivation Cryptosporidium oocysts. Another alternative disinfection method that can be considered is advanced oxidation processes. These processes involve the generation of highly reactive free radical intermediates such as the hydroxyl radicals. Advanced oxidation processes are potentially beneficial as pre-treatment steps and compliment other treatment processes well. The aim of the investigation was to determine the effect that Ultraviolet, cavitational flow and ultrasonic sound alone or in combination with each other have on protozoan cysts and oocysts, spore-baring organisms and bacteriophages. These organisms are commonly found in raw water to rural communities, therefore the investigation was conducted on two types of water, namely raw polluted water from the Klip River that receives water from an industrial area and treated effluent streams and on treated water from a conventional water treatment plant treating water from a unpolluted river.. 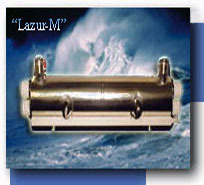 The Lazur-M3 system (Figure 1) from "SVAROG" (Russia) was used in this project. This system consists of three main parts that can be used separately or in combination with each other. The three main parts are a hydrodynamic cavitational unit, a Ultraviolet lamp and an ultrasound generator. 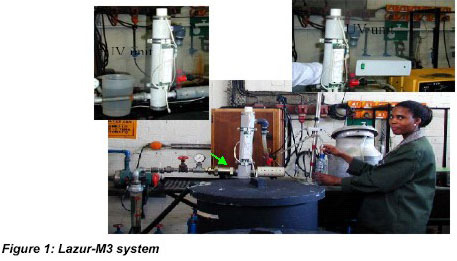 The equipment in Figure 1 was used to exposed water that contained the different micro-organisms to hydrodynamic cavitation, ultrasound and Ultraviolet treatment. Water from the vessel that contained the stock suspension of micro-organisms was pumped through the treatment units. The pump and pipe work was arranged in such a way that the flow could be controlled from 0-4m3/h by recycling or throttling the flow. The second pump was used to draw water through the Envirocheck cartage in which the (oo)cysts were retained from the secondary collecting vessel. Any configuration, in which the three treatment units could be used, is possible by selective switching off or removing one or more of the units as required. All experiments were repeated six times to ensure that reproducible results were obtained. The operating conditions used are given in Table 1.The Ultraviolet light intensity was measured when each experiment was conducted using a portable Ultraviolet flux density meter provided by "SVAROG" (Russia). b) statistical analysis was performed. The infectivity of the (oo)cysts was tested using mouse assays. The mouse assays was conducted under the supervision of Dr JPJ Joubert from the Toxicology Department at Onderstepoort Veterinary Institute, for the viability and detection of (oo)cysts. The effectiveness of three treatment procedures i.e. Ultraviolet, ultrasound and Ultraviolet plus ultrasound to inactivate (oo)cysts were tested. The mouse assays were conducted by injecting it to seven-day-old baby mice to test the inectivity of the recovered (oo)cysts. A positive control (stock suspension of live oocysts) and negative control (distilled water) were dosed into the mice. Three replicates per procedure were done. The experiment was repeated to confirm results. The mice were examined daily and were euthanazed and autopsied after seven days. The ileum was then examined for signs of infection and existation of (oo)cysts. The results of the biological analysis are summarised in Table 2. In this table the average reduction of the of different organisms as a result of the various tratment options are compared. Table 2. %reduction of organisms tested in Klip River and filtered water with combinations of hydrodynamic cavitation, ultrasound and Ultraviolet. 1 nc - non conclusive result. Although the experiments was repeated approximately 12 times results varied substantially to such an extent that statistical analysis was not recommended. From Table 2 it can be concluded that Ultraviolet, ultrasound and a combination of Ultraviolet and ultrasound treatment of filtered water produced the best results in terms of bacterial reduction. To optimise these procedure experiments were conducted to determine the most effective Ultraviolet and ultrasound dosages. The following Ultraviolet doses were tested: 7.98, 11.97, 23.93 and 47.86 mW.s/cm2. See Table 1 for operating conditions at these dosages. The effect of the different Ultraviolet dosages on different biological determinants are given in Table 3. The effect of the different ultrasound exposure on different biological determinants is given in Table 4. Table 4. Percentage reduction of microbiological determinants in filtered water exposed to ultrasound treatment. The effect of the different Ultraviolet and ultrasound dosages on different biological determinants are given in Table 5. Table 5. 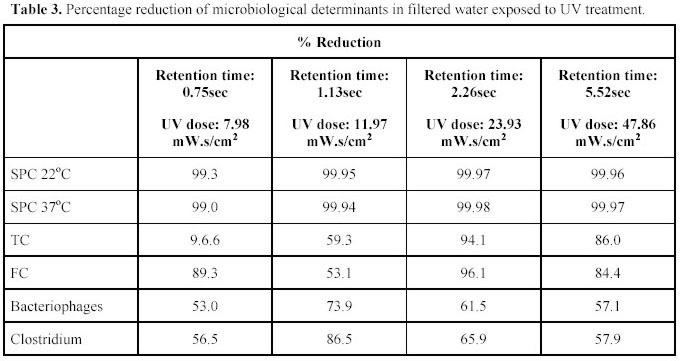 Percentages reduction of microbiological determinants in filtered water exposed to ultrasound and Ultraviolet treatment. 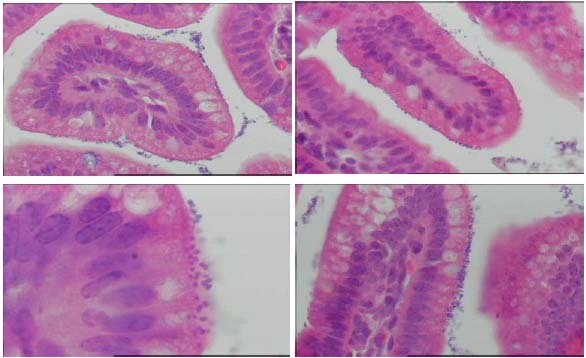 Histopathological examination of the ileum of each mouse of each replicate was performed to determine Cryptosporidium infestation. Only one of three positive control replicates was positive for Cryptosporidium infestation. The ultrasound plus Ultraviolet treatment resulted in three negative replicates. Ultraviolet treatment had two positive and one negative infested replicates. The ultrasound treatment had one positive and two negative infested replicates. The negative control showed negative results. Cryptosporidium organisms attached to the mucosa and losse in the intestinal lumen of mice can be seen in Figure 3. The total negative results for the faecal samples of all mice may indicated that it was too soon (seven day test period) for the oocysts to have developed. These results may not be as conclusive as it should, but it indicates that the combined treatment may produce the best results. Thirteen female mice, each with a litter of seven babies, five to seven days old, were received from the brooding colony and were kept in single litter cages in the laboratory animal room. The 13 litters were fed with the samples and examined daily. The 84 surviving baby mice out of 91 were euthanazed and autopsied after seven days. Faecal samples were collected from the colon of each baby mouse and preserved in 10% buffered formalin solution in separate containers and examined for the presence of Cryptosporidium oocysts with the Crypto-Cel Fluorescent Antibody test. All the faecal samples of the 13 groups tested negative. This test may not be sensitive enough, or the seven-day period from dosing to sample collection may be too short for oocyst development and excretion. Histopathological examination of the ileum of each mouse of each replicate was performed to determine Cryptosporidium infestation. Only two of the three positive control replicates were positive for Cryptosporidium infestation. This could be that the concentration of the oocyst suspension injected into the mice was too low. None of the three replicates, which received water, treated with Ultrasound plus Ultraviolet light produced any positive mice. Ultrasound treatment had one out of three replicates with three out of six mice slightly positive. The ultraviolet light group also showed one replicate out of three to be positive, but the positive replicate had five out of seven with moderate infestation. Two out of the six mice in the negative control group showed slight infestation with oocysts. These sections were stained with Giemsa stain to confirm that these organisms were Cryptosporidium and not coccoid bacteria. 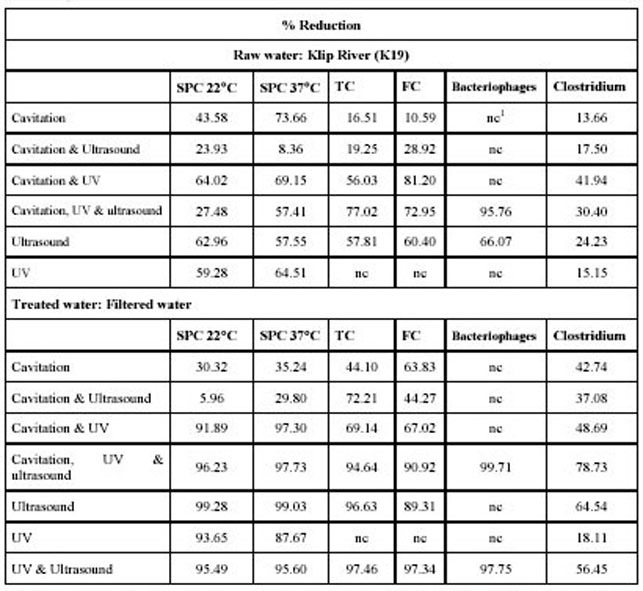 From the results on the effect of the hydrodynamic cavitation Ultraviolet and ultrasound on the biological quality of water as summarised in Table 2 we note that the number of all organisms are significantly reduced. The percentage reductions observed varied for the different type of organisms. From the results (Table 2) it was concluded that all options that include Ultraviolet treatment as well as those that used ultrasound alone produce significantly better results that those that used cavitation. An important factor that must be taken into account is that the Hydrodynamic cavitation, Ultraviolet and ultrasound were operated under predetermined experimental conditions (see Table 1, column 2). From the results in Table 3 it is noted that the optimum reduction for all the bacterial species occured at a dose of 23.93 mW.s/cm2. It was observed that lower reductions occurred at a higher dosage. From the results in Table 4 it can be seen that the retention time for greatest inactivation of most species tested for was in the order of 5.52sec. Longer retention times were not possible due to constraints in the design of the experimental unit. From the results in Table 5 it can be seen that the best results were obtained at retention times of 2.26sec. Results for the mouse infectivity indicate possible problems. The few positive mice in the single negative control group may indicate, for instance, there might have been a low-grade infestation of Cryptosporidium in the mice-breeding colony. Such an infestation may have caused a measure of immunity in some of the baby mice, explaining the number of negative results in the positive control replicates. Another factor to consider was the possibility that mice at seven days of age may be showing some natural resistance to Cryptosporidium and that they need to be dosed at an earlier age. The following conclusions can be made from experiments conducted to determine the effect of ultraviolet light by itself and in combination with either/or flow cavitation and ultrasound treatment on protozoan cysts or oocysts and other micro-organisms, in water. Although it is believed that the following conclusions hold true in general, the values mentioned for the different treatment methods may only be applicable for the equipment used under the experimental conditions. • Hydrodynamic cavitation alone is not successful in inactivating bacteria and bacteriophages. • Of the treatment options tested Ultrasound and Ultraviolet alone or in combination with each other are the most effective methods. • A retention time of 2.26s and Ultraviolet dose of 23.93mW.s/cm2 were the optimum conditions for the inactivation of bacteria in the equipment used and under the prevailing experimental conditions. A retention time of 2.26s and Ultraviolet dose of 23.93mW.s/cm2 were the optimum conditions for the inactivation of bacteria in the equipment used and under the prevailing experimental conditions. This optimum Ultraviolet dose correspond with Ultraviolet doses needed for the effectively inactivation of chlorine resistant enteroviruses (25 mW.s/cm2). This dosage is lower than the dosages of 63 mW.s/cm2 used by Rice and Hoff (1981) to reduced excystation of Giardia Lamblia by 90% and dosages of 41 mW.s/cm2 used by Bukhari et al (1999) for >4log inactivation of Cryptosporidium parvum and in the same range as the 19 mW.s/cm2 for a 3.9-log inactivation of Cryptosporidium oocysts (Bukhari et al, 1999). • The optimum retention time for ultrasound is 5.52s to deliver a reduction in standard plate counts (SPC). • A retention time of 2.26s and Ultraviolet dose of 23.93mW.s/cm2 were the optimum conditions for the inactivation of bacteria using Ultraviolet and ultrasound as treatment option. • Of all the organisms tested Clostridium was the most resistant to the experimental treatment procedures tested. This may be due to spore formation. Best reductions were observed after treatment with Ultraviolet and Ultrasound in combination. • Further treatment of clarified and filtered water with any of the possible treatment options resulted in higher inactivation of bacteria and bacteriophages than treatment of raw Klip River water with the same treatment options. • All the treatment regimes that included either Ultraviolet alone and/or in combination with cavitation/ultrasound showed higher reductions in bacterial counts than the options of cavitation treatment alone or in combination with ultrasound treatment. • Ultrasound treatment that shows promise for high bacterial and bacteriophage inactivation and was comparable with bacterial and bacteriophage inactivation by the application of only Ultraviolet treatment. • Ultraviolet/cavitation treatment as well as Ultraviolet/cavitation/ultrasound treatment did not achieve as high a bacterial and bacteriophage reduction as Ultraviolet alone or in combination with ultrasound. In this case the Ultraviolet dose was much less because of the constraints imposed by the cavitation, which reduced the reaction time and lead to lower Ultraviolet doses in the treatment unit. • Ultraviolet was the most effective treatment option with ultrasound second best. • Clostridium, which is a spore forming bacteria, showed lower reductions than other bacteria and bacteriophages. • Results obtained with protozoan cysts and oocysts were difficult to interpret because of the characteristics of the stock dose culture. Formalised cysts, containing 70% viable cysts, were used in the stock suspension. The 70% viability leaded to an uncertainty in recovery percentages and the percentage DAPI positive/negative results. Results from experiments with life cysts can be used for the interpretation of the effectiveness of treatment options. • On interpretation of the results of the mouse infectivity tests it was found that Ultraviolet and Ultrasound treatment contribution war the best to inactivate Cryptosporidium. • An important observation made was that the morphology of the Giardia cysts changed when they were treated with ultrasonic and hydrodynamic cavitation. • After the cysts and oocysts were subjected to cavitation, the whole cyst stained sky blue and instead of only the nucleus in these instances the DAPI staining was very faint. Chang JCH, Osoff SF, Lobe DC, Dorfman MH, Dumais CM, Qualls RG and Johnson JD. (1985). Ransome ME? Whitmore TN and Carrington EG. (1995). Practical Implications of Disinfection.